Kyle Marquis is a novelist and game designer from Western Massachusetts. You are the greatest magician in the Sublunar World. It is not enough. As a rare Conjunction approaches, immortality is within reach. But the gods have noticed you trying to unlock the doors of heaven. Some demand you ascend–or else–while others plot your destruction. There are only two paths for you now, archmage: immortality or annihilation. Tower Behind the Moon is an interactive fantasy novel where your choices control the story! ​Play the first four chapters for free! 0633 P Viridian Reavers, Vernal Knight fanatics ritually blinded after glimpsing the perfection of the Jade Paradise Box. 2704 P Beholder godling hollows out a 6-mile spherical miniworld where it will be the sun. It has apes and dinosaurs, but needs people. 0332 P Intelligent bear shaman with a human totem has the cunning of the human, the artisanship of the human, spells of human control, etc. 3820 P Dragon and giant play chess across the continent to decide who will be dissected to build a new cosmos and who will be the Creator. Hex a Day is my secondary Twitter account where I write site-based adventure seeds for your fantasy RPG. My first setting was The Sea of Vipers, now complete. Hex a Day is currently charting the Sophontic Principalities. The Hexaday Patreon offers exclusive adventure content! Just $1 a month gets you access to the Shadow Hexes. For $5 a month, enjoy a monthly site-based adventure! Genius: The Transgression is a tabletop game of mad science in the World of Darkness. The Water Phoenix King is a complete epic fantasy webcomic. Broken Space is my first webcomic, a science fiction adventure. You can read them all here! Pon Para art by EJ Dela Cruz. Tower Behind the Moon art by Paola Tuazon. Silverworld art by Marcelo Gallegos. 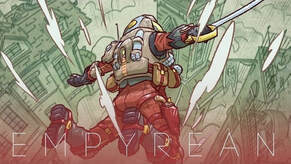 Empyrean art by Ron Chan.